To get introduced to the subject of biomarkers we propose to watch a video or its TED-ed lesson or app. The goal of this session is to explore the link between genes, biomarkers, and cancer. This is done by first playing the scientific discovery game “The cure”. The results of the game are later turned into learning by answering a few questions. 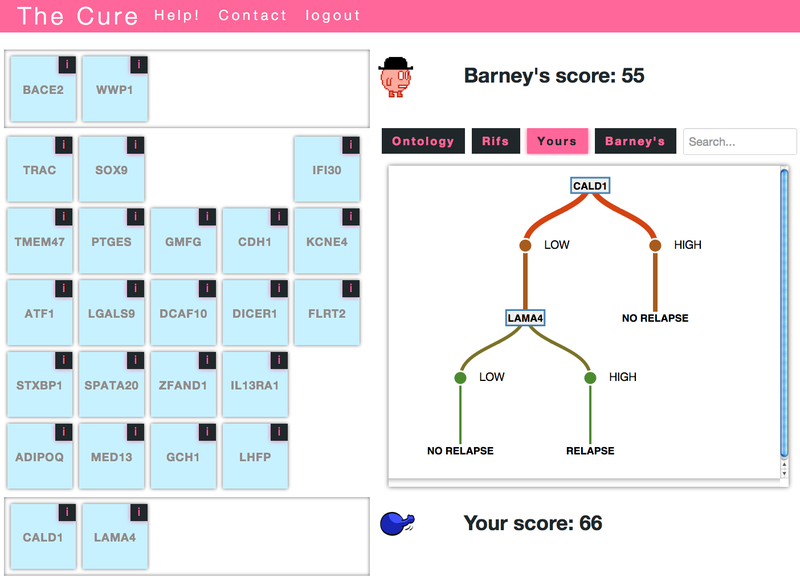 Help cure cancer: play the scientific discovery game “The Cure” (Figure 1). You should read the description of the genes and try to decide on which genes could be related to cancer given your knowledge of cancer on one side and of cellular function on the other side. As you will be playing with a scientific discovery game, the results are, by definition, not known in advance. You might therefore find associations (or lack of) that are of interest. Figure 1. Game in progress against Barney (the competing computer character). The right view shows the decision tree constructed with the genes selected by the player. Details on the game. The idea behind the game is to use players’ reasoning capabilities to solve a problem that can’t be properly solved by computers. The data to be explored is the genes’ expression profile on one side and cancer survival on the other side. The aim is to use a combination of genes to construct a predictor of survival. However, the combinations cannot be tested randomly because they are too numerous. The role of the player is to find meaningful associations (e.g. similar or complementary functions). In order to help players select appropriate genes, mousing over each gene provides the player with information including: a summary description from Unigene, Gene Ontology annotations, and related Gene Rifs (Figure 2). All of the annotations contain links to their sources that the players can follow for more information. 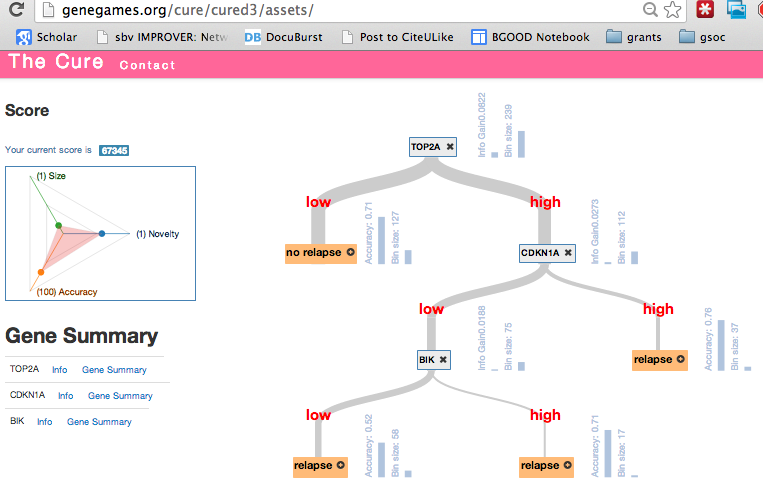 A search interface allows the player to search for genes on the board based on the text in their related annotations. Figure 2. Game in progress in the game The Cure. The right view shows the annotation data that can be consulted by the player. 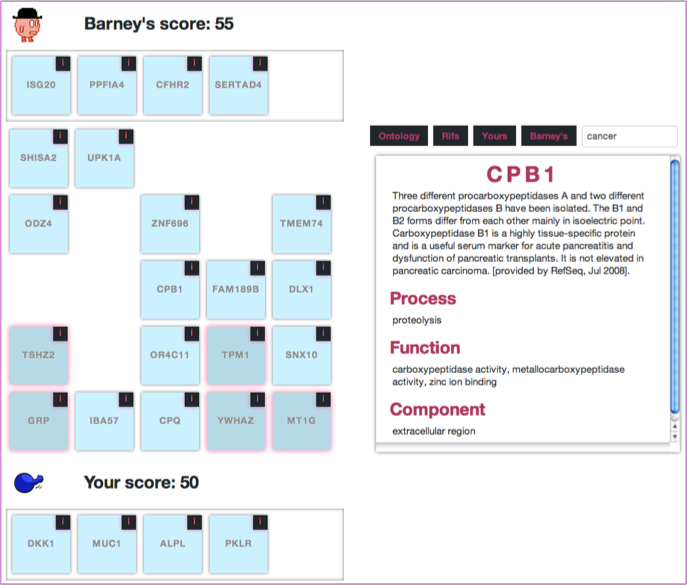 The first stage of the teaching mission is composed of 12 boards made with genes from one of the 12 key cancer pathways described in this recent Science paper. After completion of 4 boards you will have access to the manual decision tree builder allowing you to build a tree freely (Figure 3). Save that tree (using screen capture) to include it in your report. You can also share it with the class. Figure 3. Free tree building. – explain what you learned, i.e. did you identify specific functions associated with cancer? Is there any function you would explore further? why? – Is there any gene for which you find it surprising that it is (or not) associated to cancer prognosis? – give your ideas to improve this “teaching mission”. The Cure Exercise by Antoine Taly, Benjamin Good and Valérie Taly est mis à disposition selon les termes de la licence Creative Commons Attribution – Partage dans les Mêmes Conditions 3.0 France.